(This product is discontinued. Please see 9433-EMDE-ADDA-OE for its replacement.) 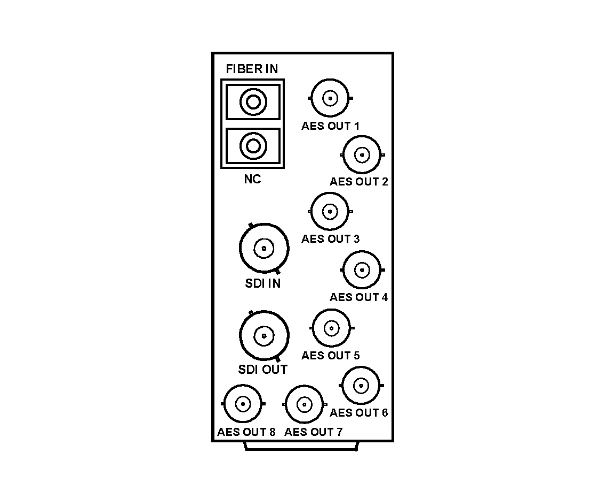 The 9216-OE-DM accepts HD/SD-SDI or fiber inputs and provides up to eight de-embedded AES pairs on DIN 1.0/2.3 connectors. The 9216-OE-DM offers full 24-bit audio processing/routing control (card edge and remote control) for individual channel gain, delay (up to one second), phase invert, as well as channel summing. AES outputs can be set to mute when routed channels fall below a selectable threshold. User presets allow fast and easy recall of custom settings. You are currently requesting a quote for 9216-OE-DM.